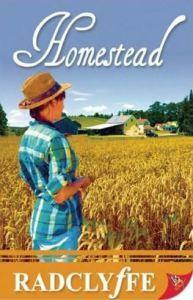 Radclyffe’s Homestead is a departure from the romances featuring doctors and first responders and so on that usually characterize her books. It’s a sequel of sorts to 2007’s When Dreams Tremble (which I don’t think I’ve read–sometimes it’s hard to tell them all apart), exploring the same upstate New York setting and featuring that couple in a minor role. Tess Rogers has always wanted to be an organic farmer, and she finally has the chance to put her plans in motion when she inherits the family farm from her uncle. It’s not easy operating a small farm, especially as a woman in a male-dominated field, but Tess is determined and has laid her plans very carefully. However, things get complicated when a powerful oil company rolls into town with R. Clayton “Clay” Sutter as their representative. There’s precious, precious oil under the farmland in Tess’s town, and the easiest way to pump it out involves access to the farm that Tess is trying to get certified as organic. It has been many years since Tess and Clay had their summer tryst at Lake George, but neither ever fully recovered from the end of the relationship. Clay, who was vacationing incognito before beginning college, never told Tess that she was the presumptive heir to a global energy business worth millions. When Clay’s father threatened to interfere, she left abruptly and hasn’t spoken a word to Tess since. For her part, Tess has tried to move on but never found anyone who made her feel quite the way that Clay did. Now that big oil has driven them together, the stage is set for a reawakening of their love! So here you have a romance that involves multiple conversations about fracking and a lot of hurt feelings about the way things ended however many years ago. Throw in Clay’s attractive assistant/bodyguard, town resentment that results in an attempt on Clay’s life and sabotage on the drilling site, a betrayal courtesy of Tess’s dead uncle, and a check-in or two with the protagonists of When Dreams Tremble, and you have a romance with a lot of parts that don’t always flow smoothly together. Despite all this, I ended up believing that Clay and Tess could make it work. My major complaint is that Clay’s father, portrayed as a distant and controlling businessman whose interference ruined the young lovers’ chance at happiness, is consistently set up as the villain. However, there is no scene where Clay is given the opportunity to confront her father and truly become independent of him. It felt like a lot of buildup and no payoff, at least as far as that aspect of the plot was concerned. Beyond that, it seemed like Clay could have gotten in touch with Tess at any point in the intervening years of her own volition before being forced to do so as part of her job. Coming into Tess’s town as an antagonist and trying not to still have feelings for her might have been an excellent dramatic decision–there would hardly be much of a story otherwise–but it makes Clay’s character seem particularly ineffectual and/or insensitive. It’s a little hard to root for someone to reunite with their lost love when Clay could have reunited with Tess at just about any point–or at least allowed her to make her own decisions. I might go out and read When Dreams Tremble to see how it ties in with Homestead, but I probably wouldn’t re-read this one. I was glad to have the opportunity to read an advance copy through Netgalley, but it wasn’t my favorite Radclyffe effort by a long shot.